Use the applet below to help you explore the distance between two points on the coordinate plane. 1. What is the horizontal distance between the two points (the distance left/right)? 2. How could you use the coordinates of the points to calculate the horizontal distance between the two points? 3. What is the vertical distance between the two points (the distance up/down)? 4. How could you use the coordinates of the points to calculate the vertical distance between the two points? 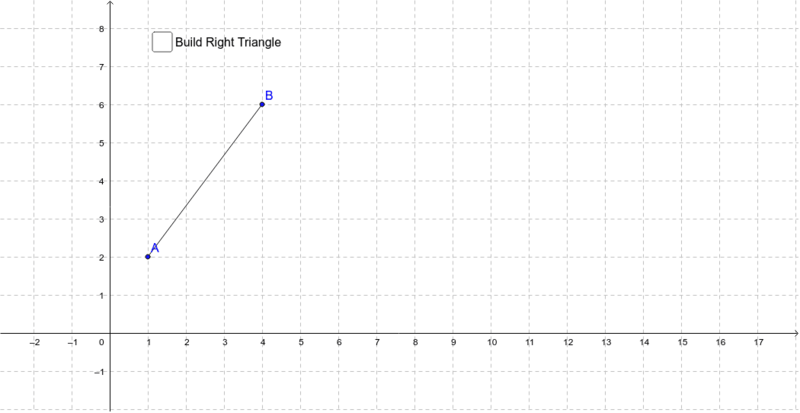 The distance between point A and B can be calculated by building a right triangle and using the Pythagorean Theorem. The horizontal and vertical distances between the points create the sides of the right triangle and the direct distance is the hypotenuse. 5. Calculate the distance between points A and B in the applet above. 6. How can you use the coordinates of any two points to find the distance between them? Create a formula that works for any two points.